Mitochondrial short-chain enoyl-CoA hydratase deficiency (ECHS1D) is caused by mutations in ECHS1 (OMIM 602292) and is a recently identified inborn error of valine and fatty acid metabolism. This defect leads to secondary mitochondrial dysfunction. The majority of previously reported patients had the Leigh syndrome, with a median life expectancy of approximately 2 years. We report two siblings born 3 years apart with prenatal findings including facial dysmorphia, oligohydramnios, intrauterine growth restriction, and premature delivery. They had severe lactic acidosis with onset within the first hours of life, had congenital dilated cardiomyopathy, and died at 16 h of life and 2 days of life, respectively. Biochemical evaluation of these patients showed elevated butyryl-carnitine in the blood and elevated methylmalonyl/succinyl-CoA and decreased hydroxybutyryl-CoA in frozen liver of patient 2, confirming abnormal short-chain fatty acid metabolism. Elevated butyryl-carnitine has been reported only in a single previous case of ECHS1 deficiency, which also had neonatal onset. Pyruvate and lactate levels were both elevated with a normal pyruvate-lactate ratio. This supports the previous hypothesis that lactic acidosis in these patients results from secondary inhibition of the pyruvate dehydrogenase complex. The biomarker 2,3-dihydroxy-2-methylbutyric acid was detected in patient 2, but at lower levels than in previously reported cases. 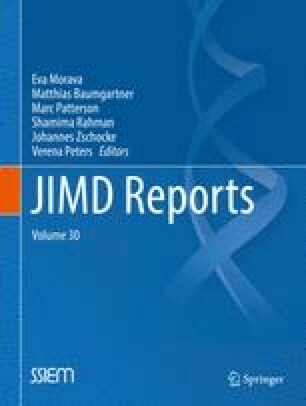 These cases extend our understanding of the severe end of the phenotypic spectrum of ECHS1 deficiency, clarify the range of biochemical abnormalities associated with this new disorder, and highlight the need to suspect this disease in patients presenting with comparable metabolic derangements and dysmorphic features. The authors thank the family for their participation in this work. The authors also thank the National Phenylketonuria Alliance, which provided salary support for RDG through the Koch Memorial Fellowship. We present two siblings with the most severe form of short-chain enoyl-CoA hydratase deficiency, including oligohydramnios, preterm delivery, dysmorphic features, agenesis of the corpus callosum, neonatal cardiomyopathy, and primary lactic acidosis with biochemical features including elevated C4, elevated pyruvate and lactate, and mild elevation of 2,3-dihydroxy-2-methylbutyric acid. Rebecca D. Ganetzky, Kaitlyn Bloom, Rebecca Ahrens-Nicklas, Andrew Edmondson, Matthew A. Deardorff, Michael J. Bennett, and Can Ficicioglu declare that they have no conflicts of interest. RDG performed clinical and biochemical evaluation for patient 1, analyzed the molecular data, and conceived and wrote the manuscript and collated data for Table 1. KB performed CoA analysis and wrote the method and discussion sections related to CoA data. RAN, AE, and MAD performed clinical evaluation and designed biochemical testing strategy for patient 2. MJB designed CoA analysis and edited the manuscript. CF conceived and edited the manuscript, provided oversight, and serves as the guarantor for the article. RDG received salary support from the National Phenylketonuria Alliance through the Koch Memorial Fellowship. MB and KB were supported in their work by the Evelyn Willing Bromley Endowed Chair in Clinical Laboratories and Pathology.